Marketplaces and digital platforms revolutionized commerce since the early 2000's. Social Networks have radically transformed the way we interact and behave, impacting business in many cases. Today, the digital revolution is entering a phase in which mature technology and society allow to blend the commercial and social aspects of such inventions, with complex management processes that many industries and B2B relationships require. The Market Networks model opens a solid innovation and digitization opportunity for fields such as construction, engineering, medicine or events planning. We will explore its principles and some success cases. 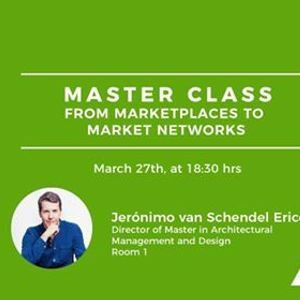 The speaker will be Jerónimo van Schendel, Director of the Master in Architectural Management and Design in IE School of A&D.